Developed specifically for maximum productivity and safety in difficult terrain conditions, the extraordinary agility, superior flotation and innate capacity for heavy draft applications of the Lamborghini Strike CM also make it an excellent solution for other tasks, as its unique track chains also ensure outstanding, uncompromised performance in the open field. Comfort unlike anything else in its class. The flat platform suspended on 4 silentblock mounts to limit the vibration transmitted from the chassis and powertrain and the ergonomic driver zone with a state of the art, mechanically sprung seat, ensure sublime levels of comfort. In addition to reducing noise even further, the optional lubricated track chains also minimise power consumption and wear. Controls arranged in keeping with the latest standards for ergonomics, and an anti-glare instrument panel with high visibility indicators lamps put the driver in total control of all the functions of the machine, maximising productivity. Conceived specifically for farming, with optimised power and torque curves for these applications, these FARMotion engines are more compact, produce less vibration and boast lower specific fuel consumption values than their predecessors. This has been achieved with a number of advanced solutions such as common rail injection with injection pressures up to 2,000 bar, a turbocharger with intercooler and wastegate, and a viscostatic fan, allowing these engines to attain Stage III B emissions compliance with a DOC catalytic converter only. Keeping you working uninterruptedly for longer is a new 95 litre tank, configured specifically to prevent fuel starvation even on very steep gradients. Choose from a 12+12 speed transmission with creeper gear or a 16+16 transmission with overdrive as standard. 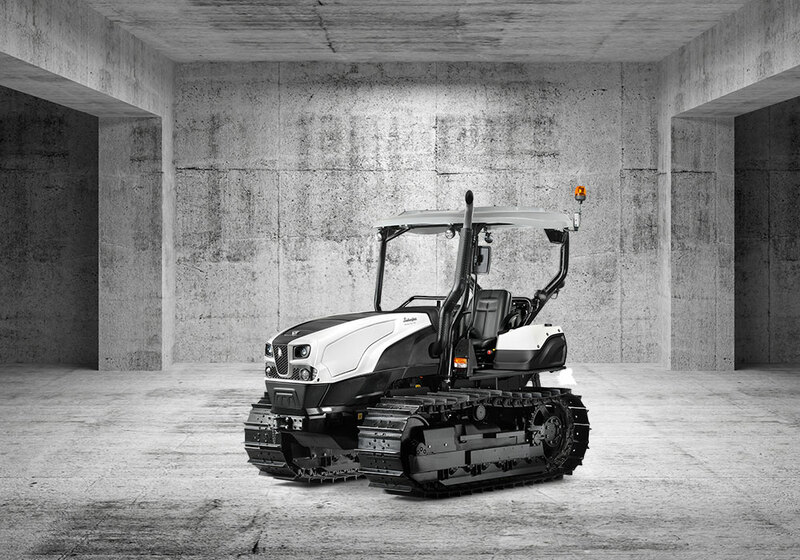 Both variants are built for outstanding productivity, toughness and reliability. A synchronised reverse shuttle and individual levers controlling the outboard steering clutches and wet disc brakes let the operator perform manoeuvres with extraordinary precision and in total safety even in the most challenging working conditions. The platform, mounted on 4 Silent-Blocks to isolate it from the rest of the tractor, is equipped as standard with a mechanical seat suspension system which effectively attenuates vibration. On either sides of the seat are two new fuel tanks shaped specifically to prevent fuel starvation even when driving on very steep gradients. The aftermarket cab ready kit available as an option consists of an increased capacity alternator, a compressor for air conditioning, lines for heating and a specific electrical system.